Everyone has those times when it’s really frowned upon to have your phone turned on. However, there are still those that need their phone on no matter what the situation. Yes, you could leave it on vibrate, but people can still hear that obnoxious buzzing noise. When they do hear it, they know exactly what that noise is. 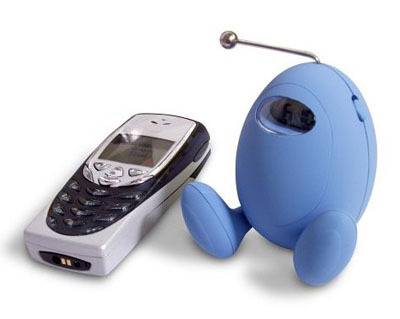 If you have a designated desk that you use at work and need to know about phone calls, this would be a great gadget. It could alert you that a phone call is coming in and you can always step out to call the person back. After all, if you’re a working parent starting out a new job, it’s nerve wrecking to know that your boss is aware that your kids keep calling you. This little egg guy just looks like a quirky robot that merely displays the time. You could even go so far as to claim it was just a silly gift from your children. When a phone call comes in, the egg just shakes his legs. It does nothing as obnoxious as flashing lights or doing something that makes enough noise to disturb anyone. So far I’ve only seen this from vendors out of the UK. For those of you within the UK it’ll cost you £3.99 from Amazon.